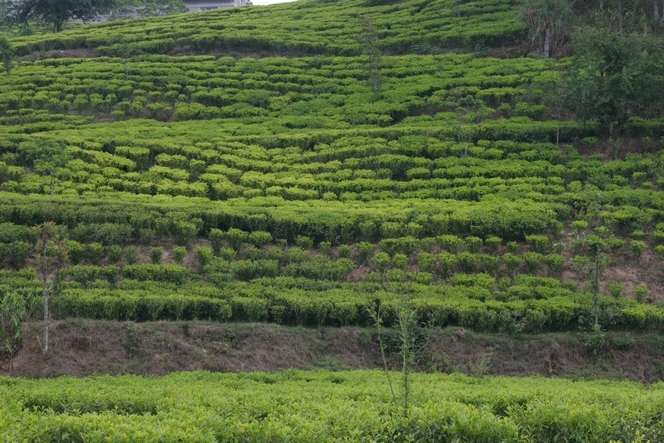 I am very aware of how lucky I am to be able to spend several months a year walking through tea fields. I never tire of it. Each tea plantation looks different. Some slope, others are flat, some are densely planted, others sparsely. Some are wooded, but the trees vary from one region to another. What I like about this photo taken on Kuwapani Tea Estate (Nepal) is the contrast in these tea trees planted in rows that are quite orderly, yet which leave room for some interesting effects. The wavy lines follow the irregularities of the terrain, with a certain sense of freedom. They have adapted to their environment. We can see how the hand of man has marked out a neat line, and nature, rebellious, has ignored it.